We are proud to present Sarra Homes' first project in North Vancouver! 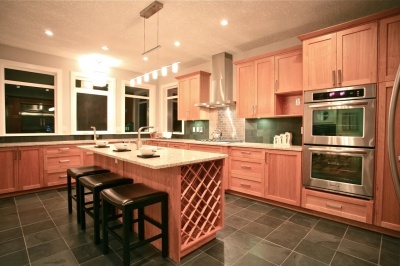 Licensed residential builder and master craftsman, Cory Howdan, has been creating dream homes in BC for over 20 years. Located on Sunnyside Drive in Capilano, access to the highway is a piece of cake, while amenties such as the Murdo Fraser Golf Course and Edgemont Village are only minutes away. For hikers and dog walkers, enjoy easy access to the trails of Upper MacKay Creek Park. Not only is this Sarra Home built with convenience and the environment in mind, it's also stunning. This beautifully designed 4 bedroom and den custom home offers the perfect layout for your family. You'll find over 3200 sqft of exceptional quality, including solid fir doors, high ceilings and exposed fir beams. 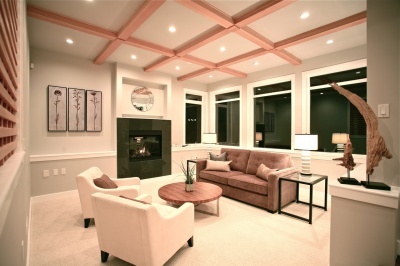 The inviting sunken living room incorporates a gorgeous coffered ceiling, a wall mounted gas fire place and natural plantation carpet. Additional flooring includes imported Peruvian Acacia hardwood and Brazilian slate tile with 3 zone NUheat radiant infloor heating. The handcrafted cherry wood kitchen is perfectly laid out and features granite counters, a gorgeous island, soft close cabinetry and Energy Star stainless steel Kitchen Aide appliances. This includes a 5 burner gas cooktop and matching hood, a double convection wall oven, a 48" built-in refrigerator, and an ultra quiet dishwasher. The home has many exclusive touches and conveniences, such as laundry on both levels, Moen’s 90 Degree series plumbing and fixtures throughout. Additional custom millwork includes the butler’s pantry, window seating, and extra wide window ledges and baseboards. Follow the unique open staircase to the top where you’ll find a stunning double sided fireplace shared with the master bedroom. In the 5 piece ensuite you’ll enjoy his and hers sinks, a Whirlpool soaker tub, an oversized glass tiled and slate shower as well as a generously sized walk-in closet. All bedrooms are located on the upper level with the 4th bedroom having been designed as an easy media room conversion with home audio rough-in. There is also a private den and formal dining room on the main floor. For the environmentally conscious, you’ll be pleased to find a commercial grade geothermal heating and cooling system, tankless hot water system, fiber cement shingles and siding with natural Brazilian slate cladding, low-e windows and a roughed-in rain water harvesting system. - CertainTeed fiber cement 8 1/4" cedar mill siding, fiber cement shingles (30 year), PVC Low-E windows (incl. screens), stamped concrete patios, exposed finished concrete driveway, 5" aluminum gutters, 5/8 aluminum downpipes, continuous vented aluminum soffits, natural Brazilian slate cladding, Brentwood Stormtank™ system, frost-free hose bibs with backflow preventers, custom built 8' solid fir front door, 16' x 8' insulated fir garage door. - Imported Peruvian acacia hardwood, imported Brazilian slate 600 x 600, Plantation natural carpet (living room and stairs), solid fir doors (main 8' and upper 7'), level style handles, flat stock 4" baseboards and casings, 2 tone textured knock-down ceilings in all main areas, 9' ceiling height and 10' in living room. - Z Series commercial geothermal and water source heat pump (c/w GeoLink flow centre, gas fired hot water on demand from Rinnia Series tankless system, 2 natural gas fireplaces with digital controllers, (1 wall mount, 1 double-sided), NUheat radiant in-floor heating (3 zone, main level slate). - KitchenAid® 48" S/S built-in fridge, KitchenAid® S/S double convection wall oven, KitchenAid® 36" 5 burner S/S gas cooktop, KitchenAid® S/S LowPro cooktop hood, KitchenAid® S/S built-in dishwasher, garburator, Samsung front load washer and dryer (main floor laundry), LG front load washer and dryer (master closet), granite counter tops, hand crafted cherry cabinetry, Pearl double stainless steel kitchen sink, Pearl single bowl prep sink in island, and built-in island wine rack. - Home audio rough-in with 6x 8" speakers (installed), 2x exterior patio speakers (roughed-in), 300amp electrical panel with Shaw and Telus service boxes, exterior (soffit) pot lights, Decor switches and plugs, interior pot lights and upgraded light fixtures. - Moen 90 Degree Series brushed nickel fixtures and faucets throughout, Toto Aquia 2 piece toilets, Pearl semi-mount sinks, Whirlpool soaker tub, walk-in shower with rain head and slide bar (glass tile and Brazilian slate). - Structural engineer designed and inspected, 2-5-10 HPO Warranty, all materials and labour to BC Building code standards or better, 2 x 6 exterior wall construction, 12" I joist floor system and 3/4" fir tongue and groove plywood, 3/8" plywood under unheated slate areas, 18" roof overhangs, and 4 roughed-in vacuum outlets. Contact the North Shore Realty team to book a private tour of this beautiful custom build by Sarra Homes! 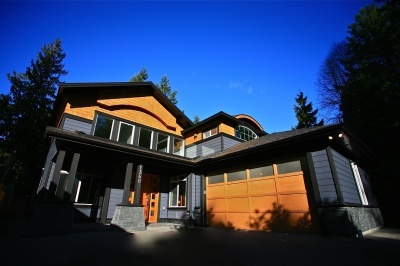 It is truly a one-of-a-kind residence in North Vancouver.